By only using small amounts of expensive hard wood the cost is reduced. We can provide FSC® even on rare species like Zebrano or Walnut. No knots, twisting, shakes or shrinkage. 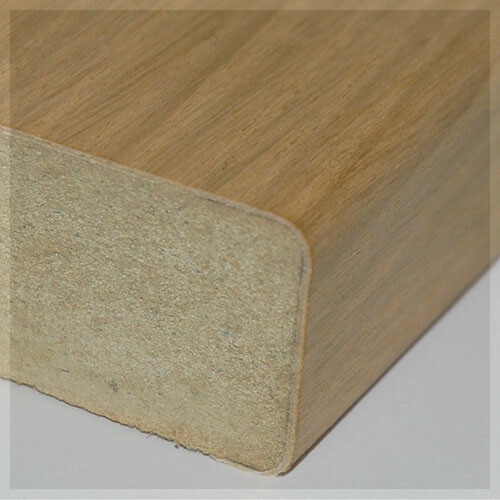 Walnut skirting can be supplied in 4.2m lengths. If reconstituted veneers are being used on a door, Morland can wrap material so frame and finishing timbers are suited. We can supply prefinished or finished to meet your requirements. Beautifully finished and indistinguishable from hard wood, Morland veneer wrapped profile is ideal for achieving a premium look without the associated cost or environmental damage.